Don’t Forget to Wear Sunscreen – Even in Winter! Fall is officially in full swing, and that means that it’s time to whip out the cardigans, jeans and boots and stow away the sunglasses, but not the sunscreen! Just because the weather has cooled down a bit, doesn’t mean that sun and its damaging UV rays have gone away. During the summer, stores haul out their stock of sunscreen and put it on display with the other summer specials, reminding customers to use sunscreen during the hot months. As fall rolls in, the sunscreen is replaced by Halloween-related products and there is no longer a constant reminder to protect your skin from the sun. To make the matter worse, it’s no longer blisteringly hot out (well, maybe that’s a good thing) and it just seems like there isn’t a reason to wear sunscreen. A lot of people make this mistake, so don’t feel bad if you do as well. According to WebMD, the best way to prevent premature skin aging and damage is to limit skin exposure to the sun by wearing sunscreen. UV rays are always present during the day, even when it’s overcast, so daily sunscreen application is a must. This will prevent wrinkles, dark spots and, ultimately, skin cancer. Remembering to put on sunscreen before you leave the house, if even for a quick outing, because it can make a difference. The best sunscreens to use to prevent sun damage are those that are SPF 30 or higher. 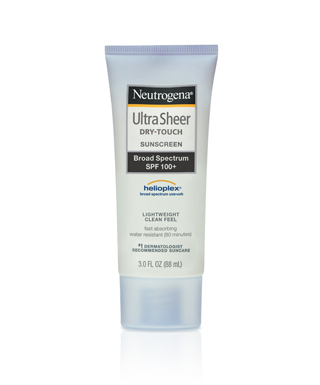 My favorite is Neutrogena’s Ultra Sheer Dry-Touch Sunscreen Broad Spectrum SPF 100+. I used to hate wearing sunscreen because I felt like it made my face look greasy, but Neutrogena’s is very light weight and not greasy at all. What I especially love about it is that it is fragrance-free, SPF 100, and I can even wear it under my make up. I carry this sunscreen with me whenever I go out, so I no longer have to avoid the sun to keep my skin healthy. Neutrogena is my go-to sunscreen, but it’s important to test out different brands to see what’s best for you and your skin type. Everyone is different, but I assure you, there is a sunscreen out there for everyone.